Chris Baldwin is a regular on the golf courses in Palm Springs. Here he reports on Desert Princess Country Club, an underrated golf club on the Cathedral City golf scene. It's sometimes hard to tell where the bunker ends and the backyard begins at Desert Princess. CATHEDRAL CITY, Calif. — Sometimes the little surprises are the best surprises. You find a $20 bill in an old coat pocket. Your spouse leaves a nice voice mail for you at work. Desert Princess Country Club is a lot like this. This 27-hole facility, right behind the Doral Desert Princess Resort, isn't on the tongue of golfers visiting Palm Springs. It's not one of those new golf courses that carry incredible buzz. It doesn't have a celebrity golf architect's name to throw around and bring out the blind big-name devotees. Its location is not particularly awe inspiring, certainly not by Palm Springs' mountain skyline standards. Yet, it's a great place to spend a day. Welcome to the afterthought with life. Desert Princess Country Club is the golf equivalent of a movie sleeper, continuing to draw people in long after the experts expected because it makes people feel good. "My Big Fat Greek Wedding," meet Desert Princess Country Club. "I come out here to play this a few times every winter," Los Angeles golfer Jay Matulick said. "It's a course that if you play well, you should be able to get a good score out of it. Not all courses are like that these days." Desert Princess Country Club isn't out to smack golfers across the back of the head. Its "10 Min. Parking Only - Violators may have carts removed" signs in front of the snack booth is about as stern as it gets out here. There is water galore. It's in play on six of the nines holes on the Lagos nine and eight of nine in the Cielo nine. But this isn't the water of Herculean forced carries. Or even Pee Wee forced carries. There's almost always a bailout area or a way to skirt around the water for players truly squeamish about the stuff. In fact after you get into a Desert Princess round, you may become convinced that forced carries were recently outlawed. And any water restrictions were lifted. It shoots out of fountains. It lays there in lakes. It dares you to cut the corner on doglegs. Sometimes you'll think that Desert Princess set out to steal Minnesota's state moniker. There aren't 10,000 lakes here, but with water on 21 of 27 holes, it creates its own powerful illusion. "There's so much water compared to a Las Vegas or a Phoenix course," Matulick said. "I can't imagine how they do it." The water bottom line's helped by having enough course-side houses to make golfers feel like they're shooting in a peanut gallery — with big patio doors an admittedly sometimes tempting target. If you're shy about playing in front of an impromptu audience, Desert Princess isn't the course for you. On No. 5 of the Cielo nine, a few twenty-something sunbathers lounged in their backyard as our group shot toward the mountain. Not that anyone's complaining about sunbathers. But if a few Pro V1s went off target, they could have landed where no gentleman could retrieve them. That's how close the backyards are to the fairways. On No. 7 of the Lagos nine — a wide-open par 5 in a course with plenty of those — spectators leaned against their fence to watch where our group's tee shots went. Their kids splashed away oblivious in the pool. When I sent a shot into a bunker off the green on Cielo No. 7, two guys sitting on their patio, shook their heads. It seemed more like disgust than sympathy. Hey, it's Desert Princess Country Club. If you cannot handle the eye-rolling house hecklers, you need to find another course. Surprises don't always announce themselves — or do everything politely. The pluses and minuses of Desert Princess are neatly illustrated in the Lagos nine's No. 6. The high mountains loom impressively ahead, setting almost a postcard backdrop. But there are so many low-lying houses along the hole that it becomes something of a schizophrenic effect. But Lagos No. 6 also curves around a lake, with a fountain about 150 yards from the green on the corner that just calls for a golfer to try and cut it. In other words, you're having so much fun, hitting shots that you wouldn't dare attempt on another course, the overbearing houses become minor annoyances. Desert Princess is packed with drivable go-for-it par 4s. Architect David Rainville can have you thinking you're John Daly on this course that can stretch to 6,781 yards. Plus, the course is in good shape — even by Palm Springs standards that have courses waging an almost one-upmanship battle of top conditioning — and the breakfast burritos at the snack booth are tasty. Make sure to work the Vista Nine into any 18-hole round. Vista is dramatically different from the other two nines with much more wide open looks and rolling fairways. It also offers the best views on Desert Princess. This isn't the course you're going to tell all your friends about back home. It is a course you may find yourself working into every return trip to Palm Springs. Just because it's fun to feel like you can make shots, swing without fear. Of course, if you do decide to return, you'll probably surprise yourself. The La Quinta Resort offers high-end, high-priced gourmet seafood at AZUR, an offspring of New York's legendary restaurant Le Bernardin. You can find pretty much all the usual suspect fast food and chain restaurants nearby as well. But the place to go for a taste of your home in Palm Springs is The River shopping center. This is a cookie cutter outdoor mall on Bob Hope Drive with a unique setup. The place is centered around a man-made stream that runs down. When the weather's good, people often sit outside along "The River" and eat their meals. If you've ever seen a real river you won't be wowed, but remember, this is the desert. Water's a big deal here. You don't have to look far for a good place to sleep. The Doral Desert Princess has suites that overlook the course and the balconies are a great spot for an early-morning room service breakfast. A flock of ducks is liable to provide a soundtrack. In fact, everything's pretty comfortable here and the staff is one of the friendliest hotel staffs you'll find. 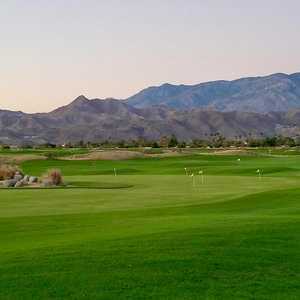 Desert Princess is country club in the old-school sense, complete with tennis courts visible right from the first tee.